So many treasured moments to hold in our hearts forever! 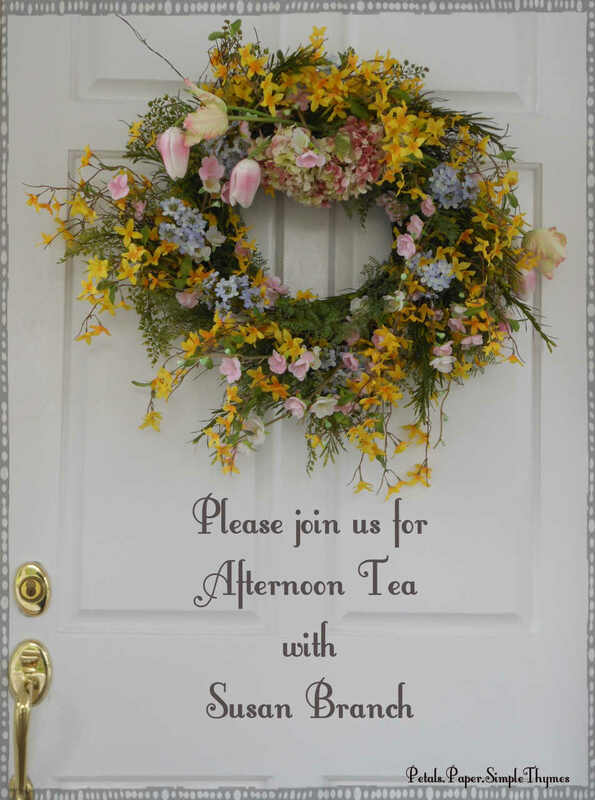 to enjoy a long-awaited, experience of a lifetime ~ Afternoon Tea with Susan Branch. 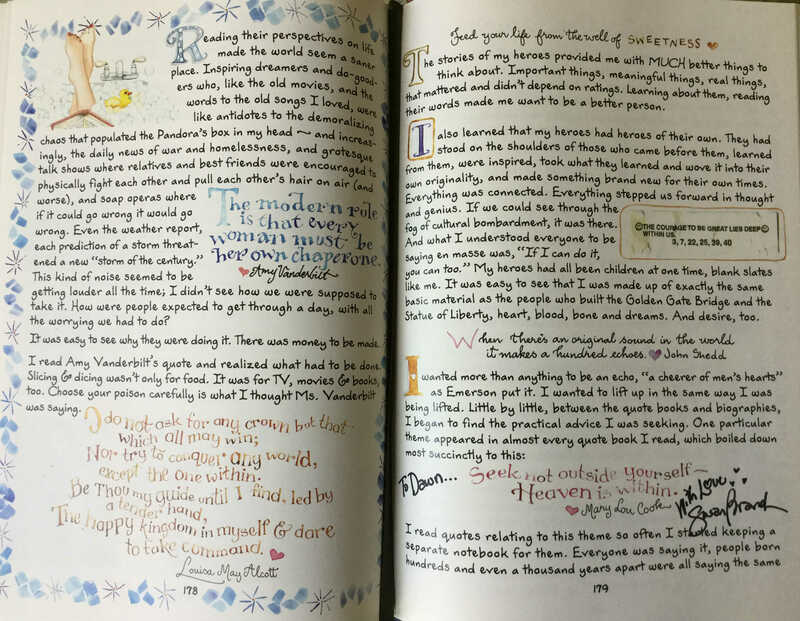 For the past thirty years, Susan Branch‘s handlettered books, filled with lovely, watercolored illustrations have been such an inspiration in my life. Our home and garden, our family traditions, our holiday celebrations, and most recently, our little blog, have soaked up the flavors of Susan’s creativity. Susan generously shares her gifts, time, and kindness with adoring readers from across the globe. She always shows us how much she appreciates her fans. This summer, Susan and Joe are celebrating the publication of Susan’s newest book, Martha’s Vineyard Isle of Dreams, already a New York Times Best Seller, by driving across the country to meet Susan’s devoted fans. Special events are planned in 23 different cities, as Susan visits small, independent bookstores across America. Here in the Midwest, our excitement grew quickly, as tickets sold out and the big day drew near! 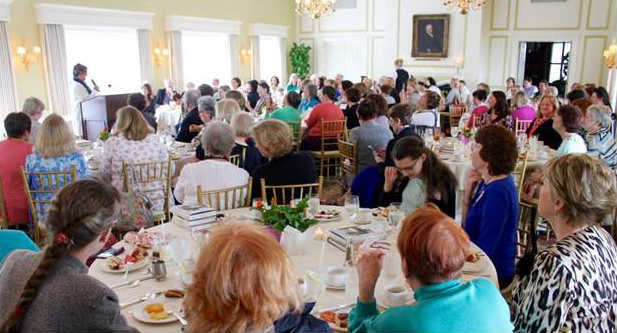 Susan would be the celebrated guest at an Afternoon Tea in her honor, where she would speak, answer questions, and sign books for her fans (lovingly known as her Girlfriends). 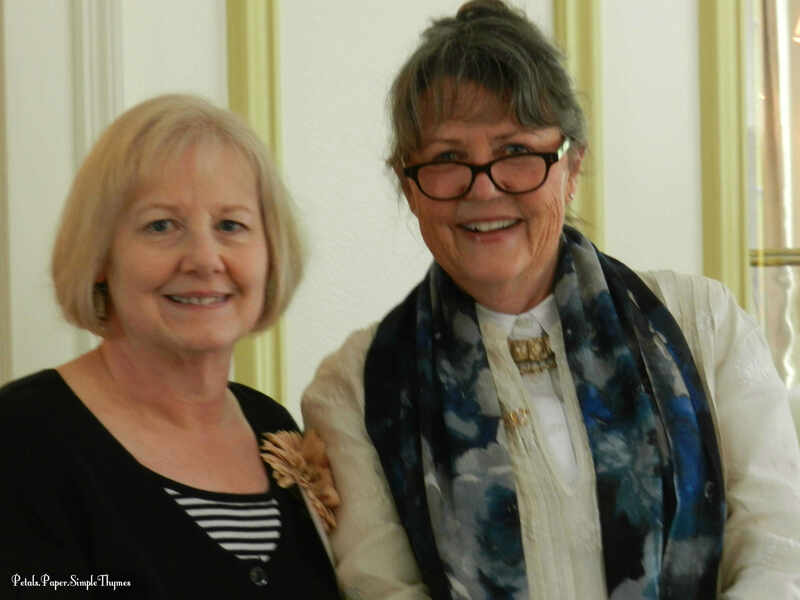 This event was Susan’s second fundraiser for The Women’s Exchange of Winnetka, where women are empowered to follow their creative spirit. Driving through heavy Chicago area traffic in a terrible rainstorm couldn’t even dampen our spirits on May 10th. 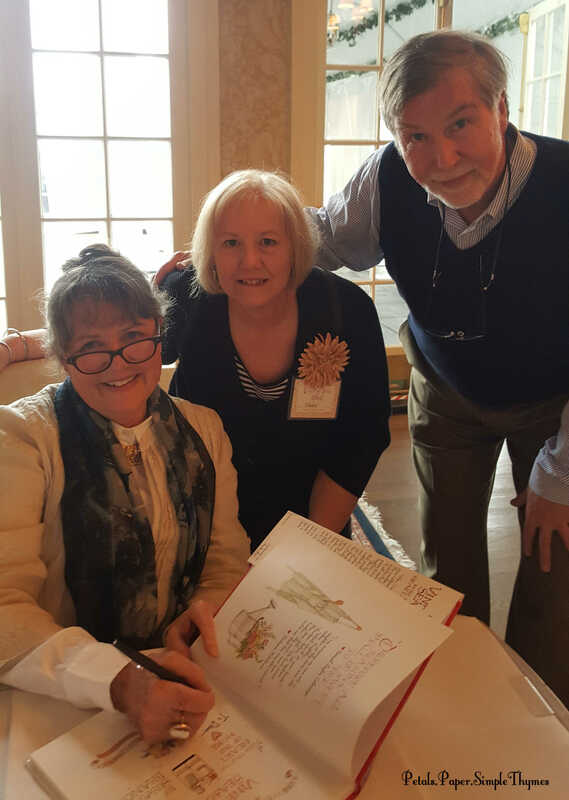 We were all just thrilled to spend an afternoon with Susan Branch… and we were bringing our own ‘sunshine’ to welcome her! 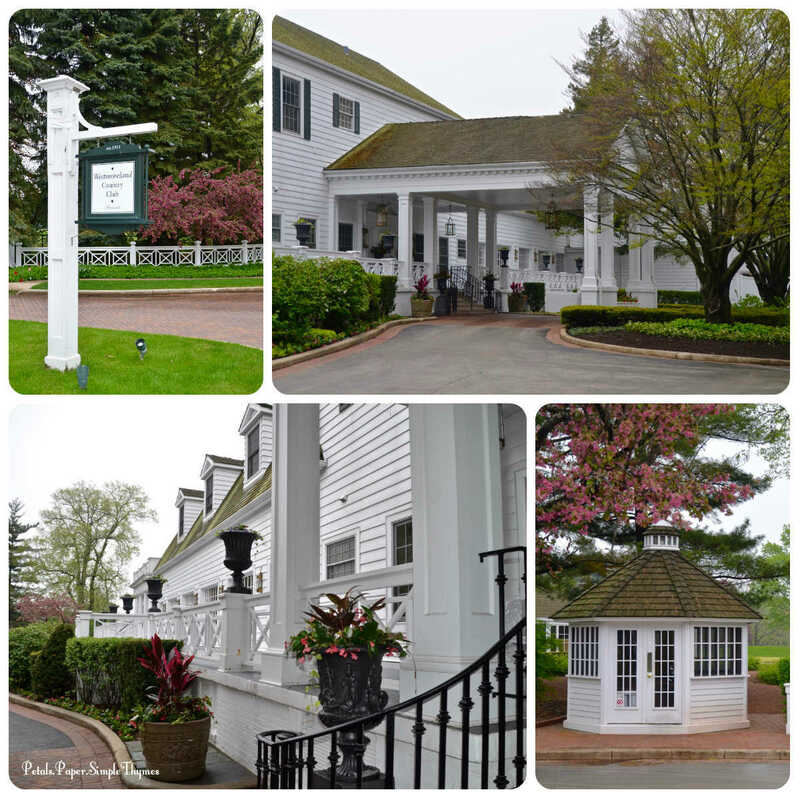 The Springtime downpour ended just in time for our special gathering of Girlfriends, at the beautiful Westmoreland Country Club, in Wilmette, Illinois. 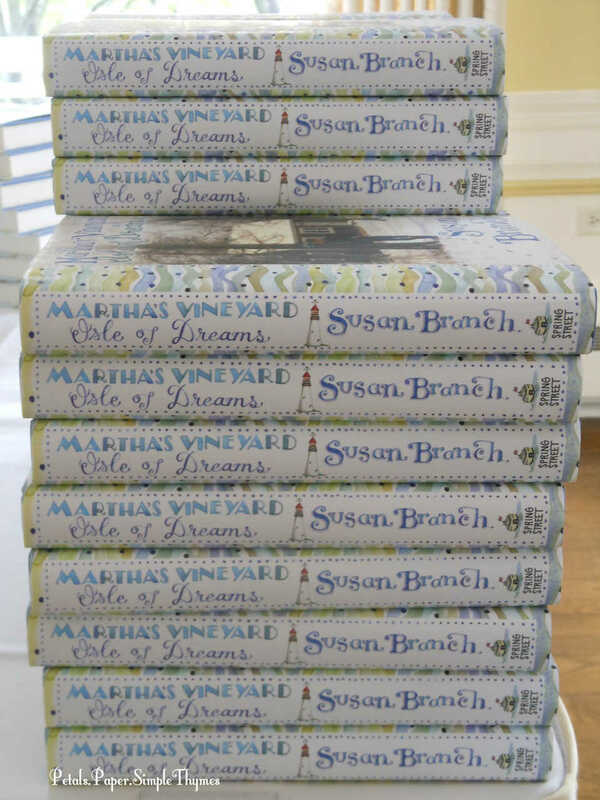 Susan’s newest book, Martha’s Vineyard Isle of Dreams, is an inspiring, handlettered, watercolored memoir. It is the most wonderful book!! Based upon diaries that she has kept her entire life, Susan has written her memoir in three parts. She thinks of The Fairy Tale Girl as the appetizer, Martha’s Vineyard Isle of Dreams as the main course, and A Fine Romance as the dessert. Susan’s devoted readers have hungrily awaited each new book in this delicious trilogy! It was time for Susan and Joe to be escorted inside by Deb, the event planner. There were 140 excited Girlfriends (and even some Guy friends) waiting inside! Still on cloud nine, I quietly ‘floated’ back to my table at the tea party. Then it dawned on me what had just happened… a treasured moment, totally unexpected, captured in my heart forever! The tea party was a feast for our eyes and taste buds. 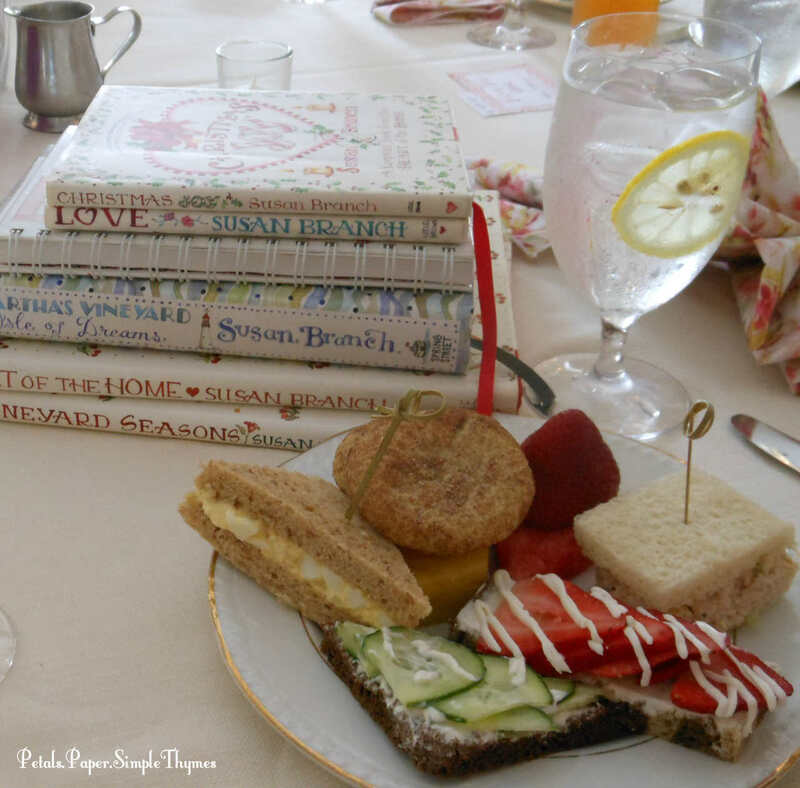 Fresh fruits, delectable tea sandwiches, scones, and desserts filled our plates, while stacks of our beloved Susan Branch books added a literary touch to our tables! Susan visited each table, warmly greeting all of the Girlfriends, while Joe took pictures and chatted with everyone. Susan and I enjoyed another quiet conversation, as I eagerly shared how closely I connected with her first home on Martha’s Vineyard. She bought her little home, Holly Oak, on her own, and with help was able to create the home and garden of her dreams. I knew just how she felt… and how this little home would forever be a part of her heart! Kindred spirits! It was time for Susan’s talk. She positively glowed with excitement and charm. Can’t you just feel the excitement in the air? 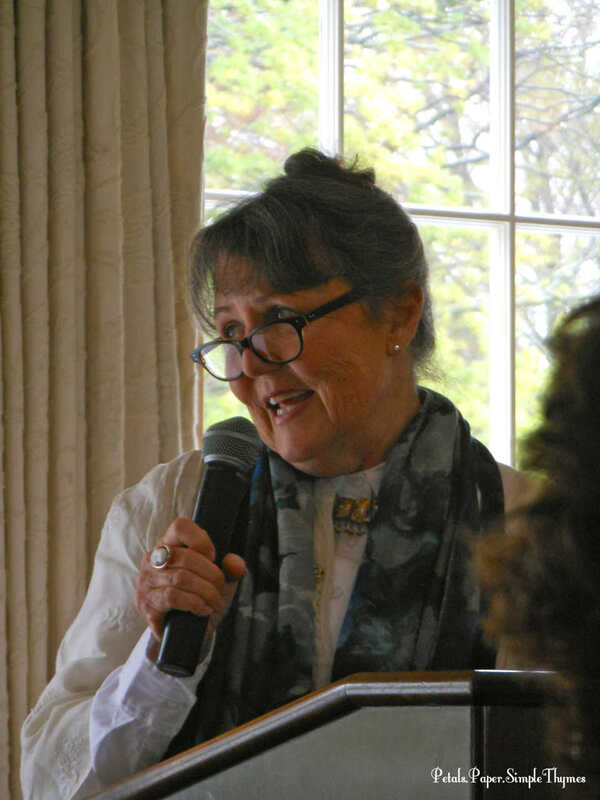 Susan shared several favorite stories from her memoirs, talked about the writing process, answered all of our questions, and even delighted us with a little song. She brought along two very special books to share with us. Susan shared how important Girlfriends have been throughout her life. We felt the same emotions as we listened with rapt attention and so much admiration. Kindred spirits, one and all! Susan shared stories of growing up, in California, as the oldest of eight children. She talked about the important lessons she learned from her parents. She shared the exciting news about selling the movie rights for her memoir. Together we suggested actresses that could portray Susan and the actor who could play the role of Joe, in a movie or tv series based upon her life. 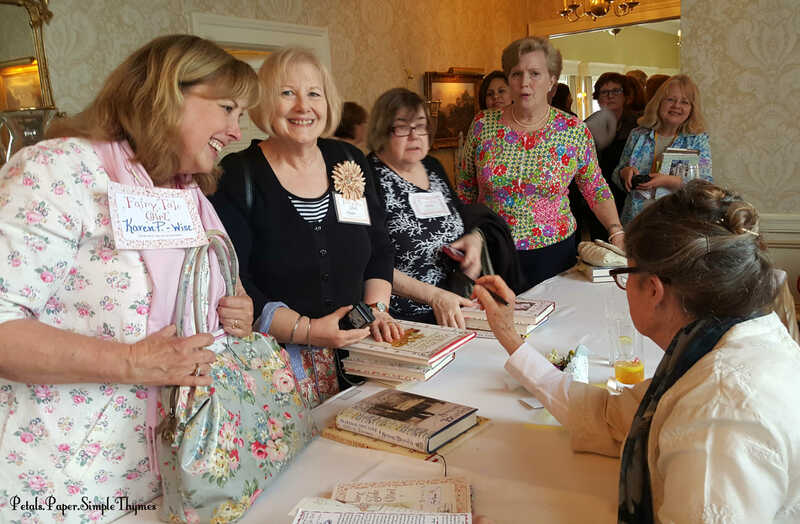 Getting to know her readers and talking one-on-one with each of us might be Susan’s favorite part of her booksigning tours. We each wore nametags (designed by Susan), so she recognized each of us right from the start. Many of the Girlfriends already know Susan quite well from her engaging blog comments, Twitter feed, and popular Facebook page. What a treat it was to visit in person that afternoon! Kindred spirits! The heartwarming stories that we shared, let Susan know just how much her books mean to all of the Girlfriends. 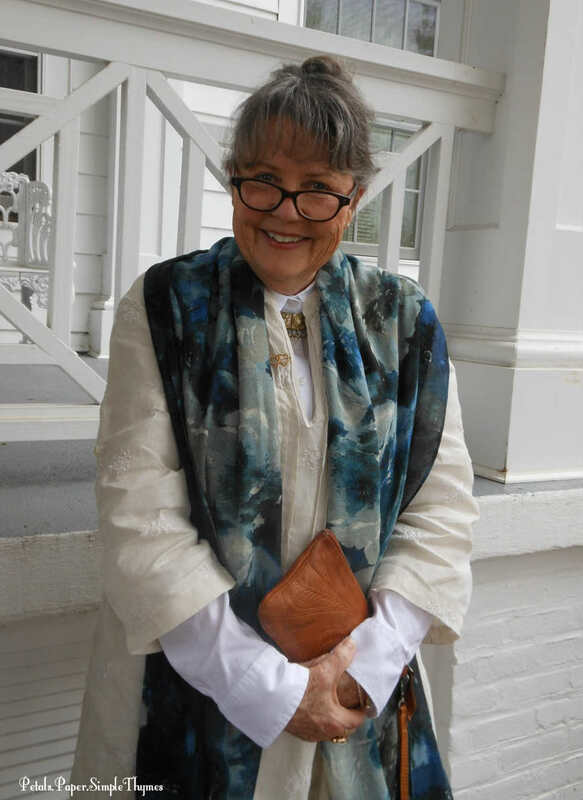 Susan took the time to connect heart-to-heart with every one of us. The lines at Susan’s book signing events are always very long… and filled with joy! For it is in these lines, that new friends meet and old friends reunite. Just imagine spending time in line chatting with women who share all the same passions. In line, I met a new friend who just happens to live four blocks from me! 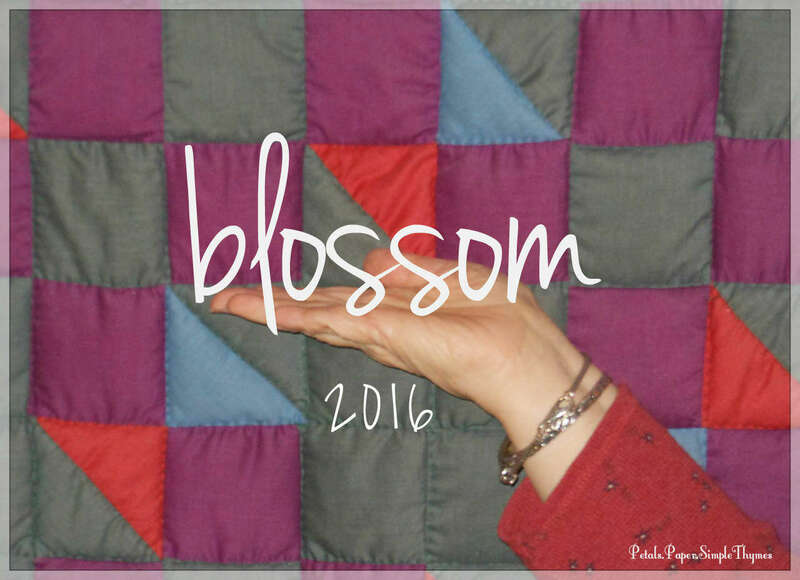 We both love teaching, gardening, decorating, and travel. Kindred spirits! Over the years, whenever I passed by her house, I always admired the charming, white picket fence, grapevine wreath, and pretty shutters. 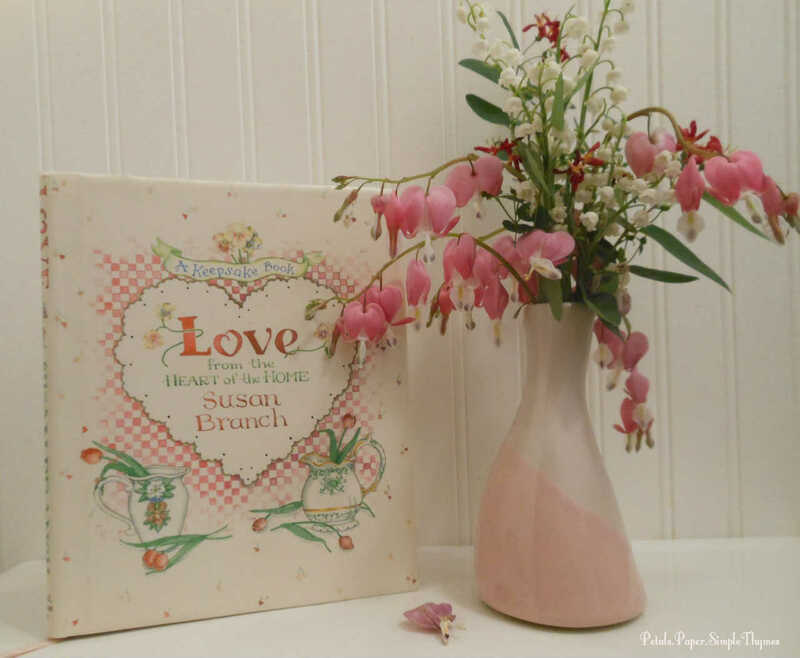 It’s so lovely to know that we both find our inspiration from Susan’s books! We are already planning to visit one another’s gardens this summer. A friend from Wisconsin met another Girlfriend standing in line, who lives in the same town, very close to her! It’s just amazing to make such wonderful connections while waiting in a booksigning line. Yet we all understand how Susan brings kindred spirits together! Of course, there were warm hugs! ♥ Lots of hugs! 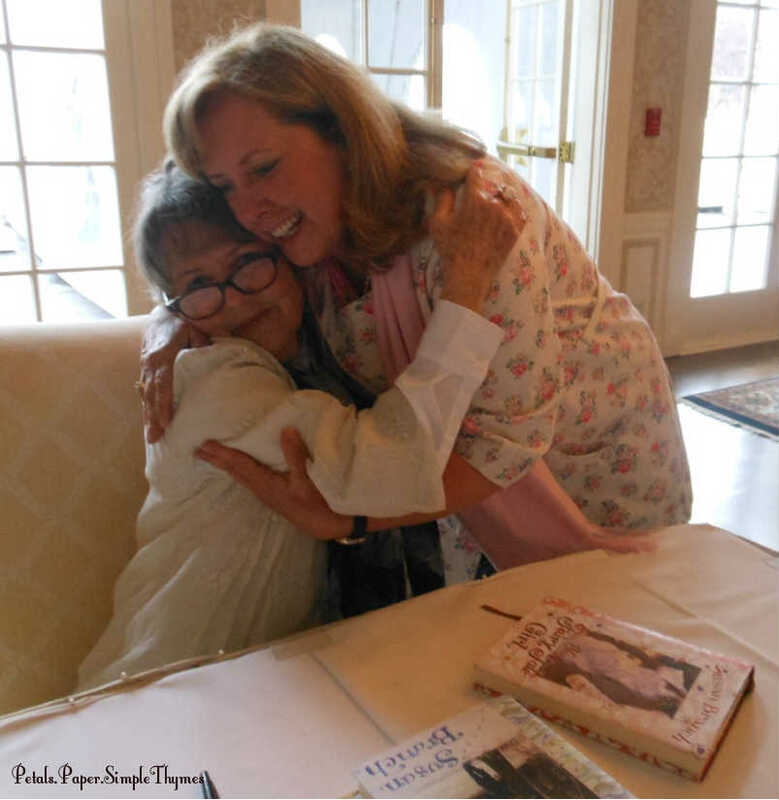 I feel so blessed to have met Susan at three different booksigning events over the years. 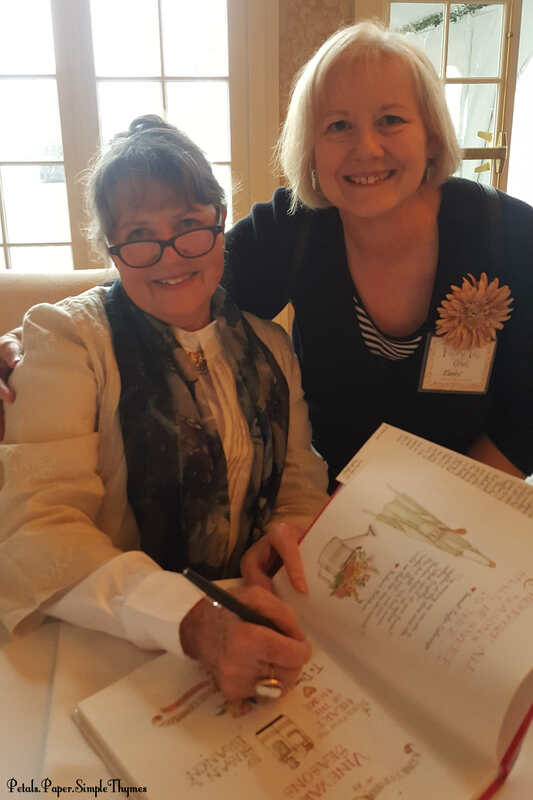 As she signed each book, I told Susan about how that book connected with my life. I told her how the recipes in her books have become part of our family traditions. I shared my tradition of gifting her Love book to each of my friends as bridal shower gifts many years ago, but never bought a copy for myself, since I never planned to be married. At the tea party, a special friend gifted me with a copy of this out-of-print book, and Susan signed it for my husband and I that very day. It felt like a complete circle of love! I told Susan how I used her ribbon bookmark to mark a passage that spoke to my heart in each book. Susan’s books are always filled with the most wonderful, handlettered quotations! Imagine my surprise, when I shared how this page and quotation in Martha’s Vineyard Isle of Dreams was so important to me… and Susan told me that it was also her most cherished quotation! ♥ Kindred spirits! Joe joined us for a photo, too! Old friends reunited… and new friends getting to know one another! Kindred spirits, one and all! Heartfelt thanks for coming to visit us, dear Susan and Joe! Safe travels as you spread happiness from coast to coast! We are all still smiling and floating on cloud nine! Kindred spirits are like that! P.S. Do you have a favorite Susan Branch book? Let us know if you have met Susan at a booksigning event. If you write a blog post about it, be sure to share a link with us! I do have several Dawn! They are lovely! Dawn, what a gorgeous post! I’m reading “A Fine Romance,” now! and for sharing your experience, here. I so enjoyed it, from beginning to end! Heartfelt thanks, dear Suzanne! It was hard to even find the words to convey the joy that everyone felt at the Afternoon Tea! I know you understand! Susan has been my inspiration for so long. I was so grateful for another chance to tell her what a difference she has made in my life! I remember reading A Fine Romance on our porch swing the very first time. I laughed and cried at Susan and Joe’s amazing journey through the English countryside! Reading her beautiful diary made it feel like we were right there with Susan and Joe on those narrow, winding roads! Be sure to try the recipe for ‘Rachel’s Lemon Butter Cookies’ in A Fine Romance! They are perfect for tea parties! There are several GF’s I am hoping to see at the signing! 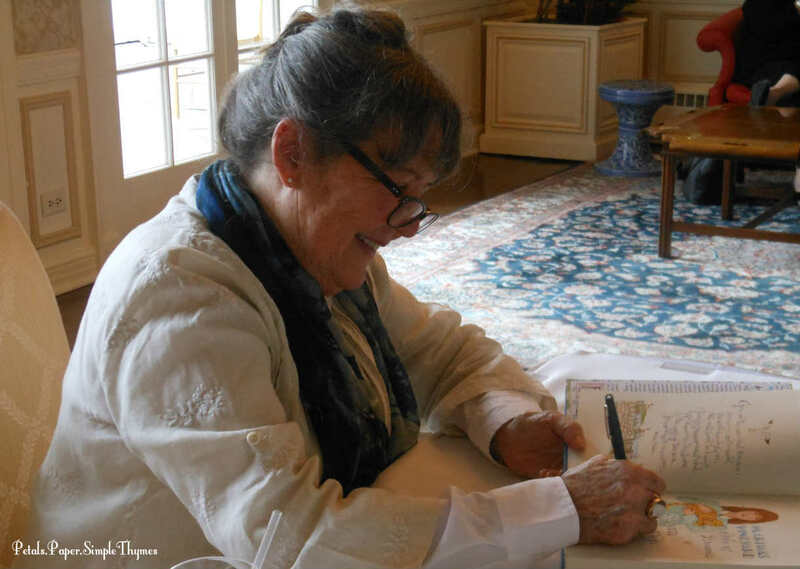 I can’t think of another author who is as loved and cherished by her fans as Susan is. She always says she flies under the radar, but with a NY Times best seller and movie rights I don’t think that will be the case much longer!! Thanks for sharing all the pictures Dawn! Wish I could have been there with you! I thought of you that afternoon, Chris! I still remember the pictures of you and your family at the Hudson, Ohio booksigning! Susan looked so cute, from head to toe, at the tea party! She truly lives a creative life ~ and her quiet, genuine, bubbly personality just sparkles and lights up the whole room! So excited that you will be bringing your entourage to Book People, in Austin. (Austin sounds like such a creative place to visit one day. It’s on my list!) Susan will be so delighted to see you again, Chris. One of the best parts of her gatherings is meeting other Girlfriends there. I really wish there had been time to walk around and talk with everyone at the tea party! It filled my heart with joy to spend the afternoon with so many happy kindred spirits! Thanks for sharing your lucky day with us! Susan is so adorable! I will finally get to meet her in Austin and so excited! Maybe I will see Chris and her entourage there. 🙂 I just love meeting new girlfriends! Thank you so much, Lisa! I couldn’t wait to share… but it was so hard to find the perfect words. I’m so excited for you to meet Susan in Austin! I know that you will feel the happy, positive energy of a gathering of kindred spirits. Meeting new Girlfriends is one of the sweetest things. I think you will be smiling for days afterward! Oh, Rachel! It’s so wonderful to meet you here! My original title for this post was actually ‘Susan’s Gifts’… She gives so much to her family, friends, her fans, and the world! We love your Lemon Butter Cookies!! They are so unique! I have served them at tea parties, and always try to explain how your special recipe made it all the way Across The Pond to my little kitchen in the Midwest. 🙂 I know that you are planning some very special times with with Susan and Joe soon! New treasured moments and adventures are just around the corner! I’m so happy for all of you!! In another bit of serendipity, I just visited your blog a few hours earlier this morning. Your beautifully written, very poignant words brought tears to my eyes, dear Rachel. Heartfelt thanks for sharing your heart with us. You are helping so many people. ♥ Sending warmest hugs all the way to your heart, from my heart. Just in time for tea, Martha Ellen! It really was a joyful event, and I think that Susan had fun, too. ♥ Her sweet, engaging, bubbly nature warmed everyone’s heart. I had just gone into the lobby to check the guest list for the arrival of another Girlfriend I was hoping to meet (since didn’t know what she looked like). As I peeked out the windows near the front door, I noticed Susan standing there. She was waiting while Joe parked the Fine Romance van. So, without thinking, I just went out to say “Welcome! We’re so happy you came to visit us!” 🙂 Pure serendipity! What a joy to spend a few quiet moments talking outside! The happy, positive chatter among the Girlfriends during tea was delightful. It’s so nice that we have so many shared passions. Waiting in line to meet Susan and have our books signed gives us time to get to know one another. It really feels like a Girlfriend celebration! Lovely, lovely post, Dawn. I was hoping you would share your time with Susan Branch and that there might be some photos – and here they all are. 🙂 You certainly carry the spirit of the day and certainly of Susan with you, Dawn, and it is sweet that you share it with all the kindred spirits out here in blogland. Thank you. I just returned from a week in Cambria, on California’s central coast, to celebrate my Mom’s 95th birthday. While there, I read Susan Branch’s latest book. She even mentions Cambria, Arroyo Grande and San Luis Obispo. All of which we had enjoyed on this trip. What a coincidence! Kindred spirits abound! Oh how fun to go to a book Signing with Susan Branch! I think I have all her books and just finished Isle Of Dreams last night in fact. Rhubarb Crisp is on the menu today here at Chestnut Hill- gloomy day but planting pots for outside and yummy kitchen smells make it all that much better! 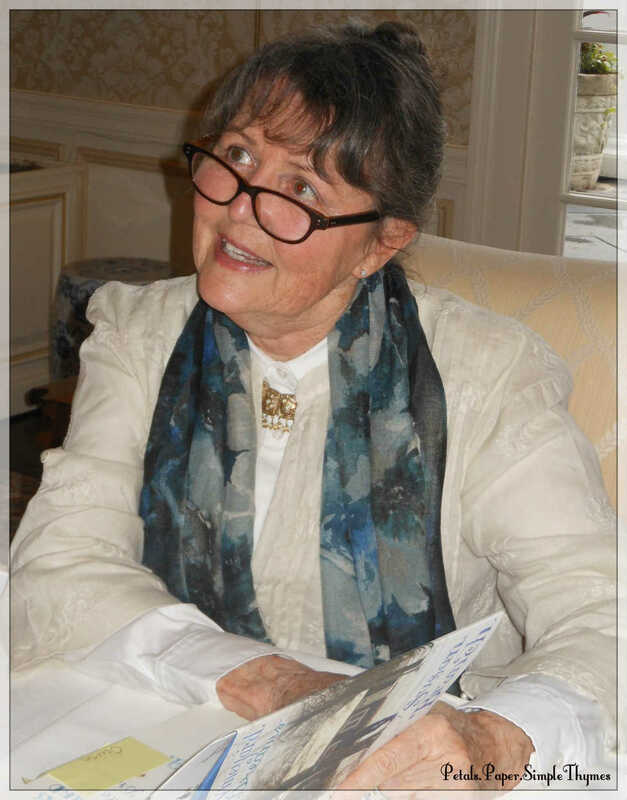 Thanks for the Virtual tour of a book signing – such a treat! Welcome, Carol! How lovely to meet a new Girlfriend! I connected with Martha’s Vineyard Isle of Dreams in so many ways! As I read, I remembered so many small moments in my own life. It’s truly a treasure that I will read again and again! Rhubarb Crisp and planting pots of flowers will add sunshine to a gloomy day. 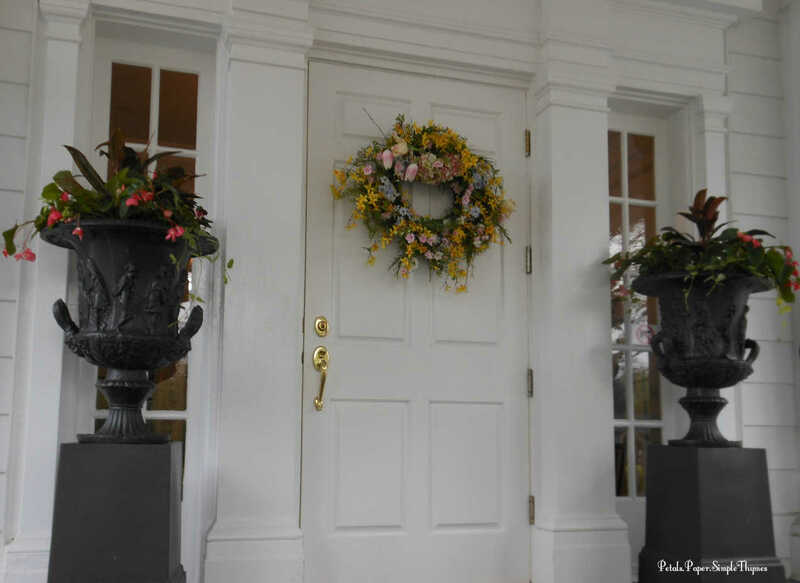 I’m looking forward to planting pots of flowers for our front porch today, too! Our nighttime temperatures have finally warmed up. So, it’s a perfect day for planting! Thanks so much for stopping to visit and joining in the conversation, Carol! Kindred spirits! What a wonderful experience. You must feel like old friends with Susan since you’ve had tea with her 3 times. I think she is one of those rare people that make everyone feel like a good friend! I love her books and her blog. What a lovely afternoon with Susan and all the girlfriends…memories made for a lifetime. Dawn, what a wonderful, made-to-order, kind of day. I’m so happy for you. Thanks to you, I’m now reading her books. I have Martha’s Vineyard, but no time just now to indulge. I hope so soon. And fabric! Be still my heart. I loved all your photos and the joy you’ve infused here. What a special day. Thanks for sharing it with us. Ok, 8 months later…!! Finally catching up on some long-saved emails. This is such a charming post. It’s through Susan Branch that we first connected with each other’s blogs (although mine is no longer active.) Certain people have a way of sending connecting threads all throughout the world. I’m so glad you had this wonderful opportunity!